Russian epic pagan folk metallers Стожар (Stozhar) from Yaroslavl have recently released their debut full-length album “Ни Шагу Назад (No Retreat)“. The band was formed in 2005 with only two members, Yarosvet and Elena Lebedeva. As a duo, Стожар recorded and self-released the demo “Языческая Русь” in 2007, but after that Elena left the band. Yarosvet gathered new members and in 2009 the band started its first concerts. After several changes the final line-up, that remains the same till today, was completed in 2010. Soon the band started recording its debut album, which was finally released on April 25th, 2013 via Stygian Crypt Productions. “Ни Шагу Назад“ is a very diverse album, moving between various genres. Of course the core of their music is pagan metal, but this is a rather wide description to contain their style. 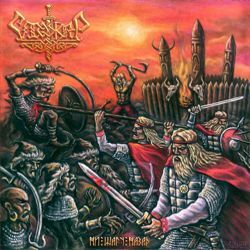 Their sound is actually a combination of epic metal, folk metal, melodic metal and pagan black metal, with each genre becoming more or less dominant, depending on the mood of each of the 9 songs of this 34-minutes long album. Their guitars are equally epic, melodic and technical and except for the typical epic pagan riffs the band adds some beautiful solos and acoustic guitars. Synths, violins, flutes, bagpipes and accordion add bigger depth and quality in their orchestrations. Their traditional instruments have a very natural sound and the difficulties the band faced in the live recordings of these instruments was one of the reasons for the album’s delay. Стожар sing mostly with epic clean vocals that have a very personal characteristic color and at times a weird (but interesting) echo distortion, while they also add some pagan black metal vocals in several songs. All of their lyrics are in their native language, dealing with their culture, local mythology and the pagan beliefs of their ancestors. Стожар is a band with a very personal sound and each time I listen to it, the more I like it. It is a fact that the production could be better, but on the other hand this could alter their distinctive sound. Anyway, what counts the most is that “Ни Шагу Назад” is a great debut album from a band that gained my attention and made me really looking forward for its next step! The CD is released by Stygian Crypt in a standard jewel case edition with a beautiful 20-page booklet, illustrated by Gudliefr and printed in matte paper. For more info and sound samples you can visit the band’s official pages.